On Friday, August 7th, the Connecticut Sun will host Breast Health Awareness Day at Mohegan Sun Arena when they take on the Washington Mystics at 7 p.m. The team will wear special pink uniforms to mark the occasion, and breast cancer survivors will participate in the pregame ball exchange. The first 4,000 people in attendance will receive a special pink Sun stress ball. A silent auction will be held on the arena concourse to benefit breast health awareness charities. 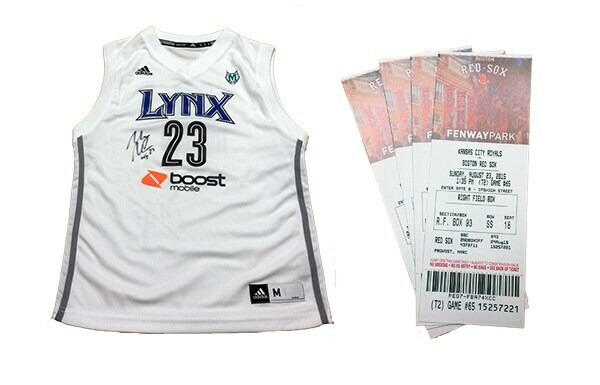 Some items in the auction include an autographed 2015 WNBA All-Star Game shooting shirt signed by Tamika Catchings following her final All-Star appearance, tickets to the Sylvania 300 at New Hampshire Motor Speedway, tickets to the Deutsche Bank Championship, a signed Maya Moore replica jersey and Boston Red Sox tickets (shown below). More items will be unveiled in the coming days, so keep checking back for more!